Recently we had a customer call us, explaining that “Google Drive deleted my files” after she downloaded Drive for PC. Apparently this occurred during the first sync Google Drive initiated. This not a data recovery case we had seen before, so we did some searching around, and found that the files might be in the Trash folder in Google Drive. (You may need to click ‘More’ on the left side to reveal the Trash folder) Fortunately for our customer, all of her missing files were in the Trash folder and she was able to restore them. 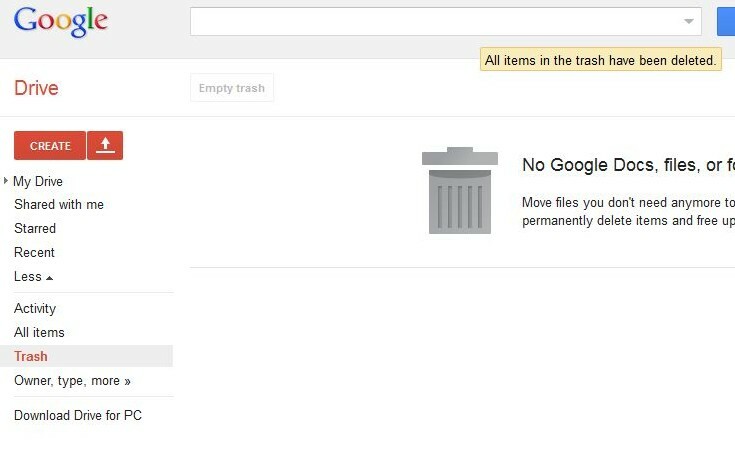 If you move or delete files from the Google Drive folder on your computer, those files will be moved to the trash folder in the online component of Google Drive. If you move a file into the Google Drive online trash folder, and that file is synced on your computer, it will be moved to the recycle bin on your computer as well. If you move files “around” or don’t check them during a sync, Google Drive may delete them. Since this seems like it is a common problem, we wanted to put this post up. If you are missing files after a Google Drive sync, check the Trash folder in the online version of Google Drive. It might just save your day.